On my last trip over to Woburn trails I came off trying to jump some small doubles, bent my front wheel and got a very sore arse. Mark from Broken Spoke Cycles managed to straighten the wheel but afterwards I was snapping spokes on a weekly basis so they were obviously under a lot of extra stress keeping the bent rim true. I asked if Mark would find me a new rim and build me a wheel using my original hub. My tyres and discs were also shot, so I said I’d need some new rubber and front disc and pads too. 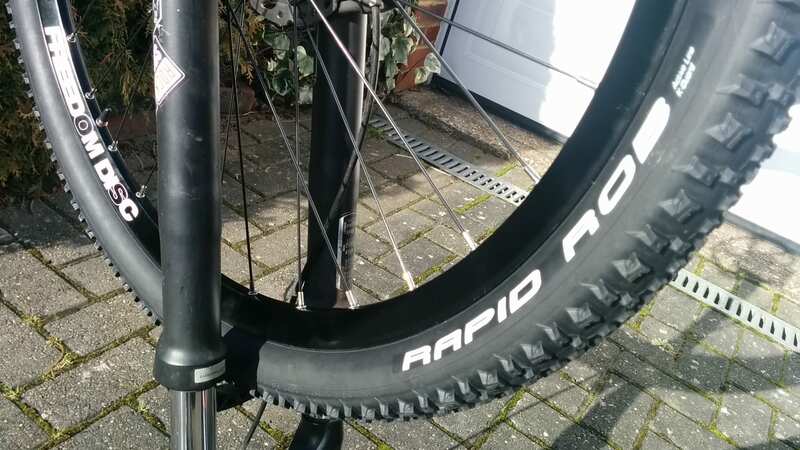 It’s a Halo ‘freedom disc’ rim with stainless spokes, he’s thrown in a new tube and wrapped it up with a Schwalbe ‘rapid rob’ tyre. Shimano had discontinued my original brake discs but Mark figured out what would work with my setup and got me another suitable Shimano replacement and a set of pads to match. It’s not the lightest, but I’m not overly bothered about weight, I asked for something that would take some abuse and I think this will do the job nicely.